Juan Antonio Tapia on the bajo-sexto and Santiago Jimenez Jr. on the accordion. The 7th annual Freddie Gomez Memorial Conjunto Concert took place this past Saturday night in Brownsville, and it was a loving tribute to conjunto music as a whole, and to the pioneers of this genre of music in South Texas. Timo Ruedas, Juan Antonio Tapia, Lupe Saenz, and all the people at the South Texas Conjunto Association (STCA) deserve credit for leading the way for grassroots conjunto music here in the Rio Grande Valley. When this event was organized, the idea that the STCA Brownsville Chapter had in mind was to have sons of conjunto pioneers honor their legendary fathers. So we had Santiago Jimenez Jr., the brother of Flaco Jimenez and a 2015 recipient of the National Medal of the Arts, paying homage to his father Don Santiago Jimenez Sr.
Santiago Jr. went up there, drank a bit of beer (he famously has talked about how drinking beer helps him perform on stage, adding a little bit of flavor to his music and helping put him at ease), and delivered a great 45 minute set. At one point, someone asked that he play “El Rosalito”, and he honored that request. The highlight to me was seeing him perform “Viva Seguin”, the great polka from his father, and a piece that has lived on thanks to Flaco and Santiago Jr. At the end, Santiago Jr. got a bit choked up during his emotional rendition of “Homenaje A Don Santiago Jimenez,” a corrido that told the story of his father. Afterwards, Santiago Jr. sold copies of his new CD, which has a cover photo of him receiving the National Medal of the Arts from former President Barack Obama. Finally the Gilberto “Chore” Perez Jr. y su conjunto stepped on the stage to close at the night in Downtown Brownsville. Bajo-sexto player Gilberto Jr. announced a warm message from his father, Gilberto Sr., who resides in Mercedes and is still an active performer in the local conjunto scene. The conjunto played a nice variety, including a polka, a huapango, and even the Gilberto Sr. classic “El Dia de tu Boda”, one of my all time favorite songs. Composed by Ramon Medina, the song was recorded at Falcon Records by the composer and Gilberto Sr. on November of 1959. The emotional song also reminded me of my own father, who always remembers the song from his childhood. Tapia deserves a special shout out for the different roles he took on during the night: a key member of the Brownsville chapter of the STCA, the bajo-sexto player for Santiago Jr., and the accordionist for Gilberto Jr. He did a great job on all fronts. So all in all, it was a lovely night of conjunto music in Brownsville this past Saturday night. Was also happy to see many conjunto regulars in attendance, like Raul and Amelia Martinez, and the Perales Family. You know it’s a great conjunto event when you see these folks there. I’m very much looking forward to the next year’s celebration of conjunto music. 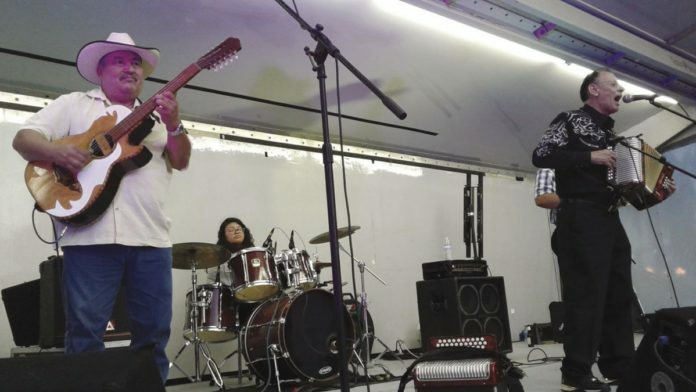 With the future of the Narciso Martinez Cultural Arts Center Conjunto Festival being uncertain, after having established itself during its 25-year run, this annual event in Brownsville might become the only community conjunto festival for this region. So if you can make it out there the next time this extravaganza takes place, I strongly recommend you check it out and support it.